You have done great work on ball chains but what happens if they change the spec of the ball chain in the future and make your work useless? 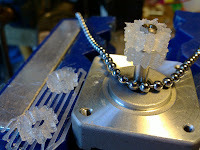 The part can still be a ball chain and not work on your design. I appreciate that the cost of timing belt is too high in New Zealand. I just feel you are trying to solve the wrong problem. I feel this is a commercial problem i.e. T2.5 belt is too expensive. Rather than a technical one. Anyway I am trying to buy a bulk load of T2.5 from china. The deal hasn’t happened yet but if it does go through would you be interested in 5M of T2.5 as a donation for all your hard work on the reprap project? Just leave me a note if you are interested. Thank you for your kind and generous offer. It is heart-warming to see such support. Please, do donate this belt to some enthusiastic potential reprap owners in my stead. I can afford belt - I can buy ESky Helicopter Belt from DealExtreme in bulk. The problem is that I cannot print gears for T2 or T2.5 belt. Sure, I can get them lasercut, but I'm actually trying to fix the problem for people worldwide. People who can't get drive belt or lasercut parts for love nor money, possibly people lacking either. Don't worry about the ball chain size changing - there are a number of standard sizes, and enough demand to ensure security of supply. 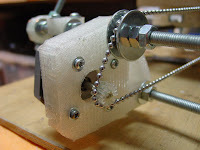 It is a simple matter to rescale the gears to fit different sizes of chain. Indeed, there is some flexibility in the design of these spaced gears that allows a variety of chain sizes to be used with the same gears! Vik: which belts from DX are compatible with mendel? Or are you printing custom parts for them? You have to make your own gears for the DealExtreme belt. I used sku.15586 which will do X & Y with 3 packs. For Z I used 4.5mm ball chain. VIk, what method have you used to make your Z axis into a loop. I've tried using the standard coupling, as well as using wire soldered onto the balls but couldn't work out the method. Is there a trick to it? Thanks for that Vik, you've saved me a load of trouble and madness.